Okay, I’m finishing up the most boring marketing book in the world, so I need something interesting to read. I keep hearing that this has some interesting stuff in it so I’m choosing this as the next CPSO Book Club Selection. This will be my first official Kindle read. I just realized the downside of the Kindle is the inability to perceive the size of the book by seeing how thick/heavy it is. 320 pages it says. So once I/any of you dive in we can decide how long we might need to read it, then I’ll plan an outing. The last time we met was very fun. And you can feel free to come if you didn’t read the book as we spent more time talking about (really, do I have to spell it out?….) CPS! And having some wine. Neighborhood School Fair	Random Weekend Post: Suntimes Rankings! Network changes! It’s actually a quick read. Not as much data as I had expected, but goes by quickly since it focuses on the experiences of 3 students with data only thrown in heavily at the beginning and occasionally in the rest of the book. 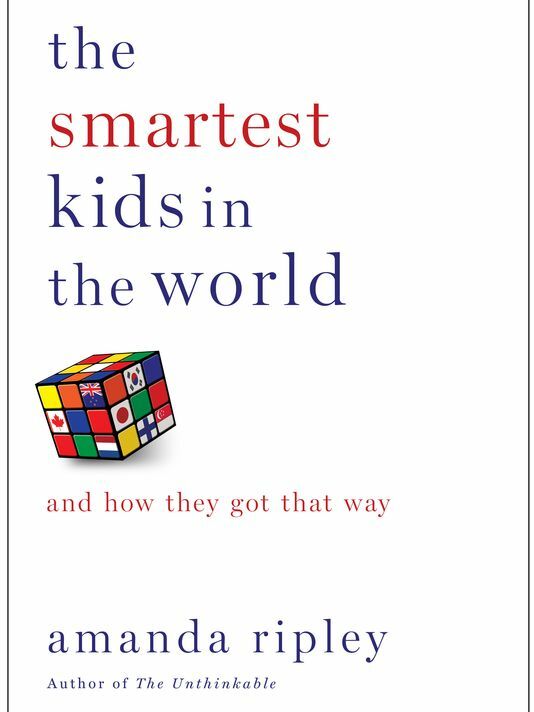 Wow, little blurb from the book – the typical Beverly Hills kid performs below average on a skills test compared to Canada. We told ourselves (the US) that we were at least raising more creative children, the kind who might not excel in electrical engineering but who had the audacity to speak up, to invent, and to redefine what was possible. But was there a way to know if we were right? Sound to me like a lame excuse for being unwilling to teach the skills necessary to excel in electrical engineering to American children. Not unable, mind you, because other countries have been doing it successfuly, so the proper methods and textbooks for teaching math and science do exist. Yet for some unexplicable reason American schools refuse to use them, and waste time and money on things like Everyday Math and whatever passes for other STEM subjects in older grades. One interesting point that was just discussed is the ACT/grade requirements for teaching school being fairly low, completely mirroring what we discussed last week about the average teacher ACT score. By nature, most profession’s workers’ ACT scores probably reflect the admission criteria for that profession. This is where finland changed the teaching profession, by dramatically raising the standards of entry. I’m pretty much determining that what other countries have done is impossible here because the US can’t come to consensus on anything, as evidenced by the govt shutdown. Hopefully she’ll convince me otherwise by the end. Perhaps at a local level… These countries also put more effort/$ towards educating their poorest students which is the opposite of the US and I really doubt that will ever change. The book was a pleasant, very easy read. It definitely will give you some food for thought about the US Education system and potentially your own child’s education and priorities. I really like how she uses the insights of bright high school students who studied here and abroad to compare the education systems. Also, you’ll learn more about the mysterious and wondrous Finnish way of schooling. I can’t say the book has all the answers, but definitely has some interesting information and raises some good questions. I just started reading this book and cannot put it down. I would love to join the book club discussion! Do you guys want to meet for book club in December or wait until January? For those without reading time, feel free to watch the video and join us! My vote is January but that is mostly because I am still waiting for the library to cough up the book for me. I only just realized that the author of this book wrote another book I really enjoyed called “The Unthinkable: Who Survives When Disaster Strikes – and Why.” It’s a fascinating book about how people survive disasters that appeals to my worst-case-scenario nature. Both books are easy to read and include data, anecdotes, and interviews which makes for interesting reading. Colors also contribute too total beauty of your garden. Go ahead. Well, everyone with doigs wants too be like Amtrak. The book has a lot of positives that make it a worthwhile read. The author is right that it’s too easy to become a teacher in the U.S. I went to law school at the University of Illinois College of Law and was surrounded by very intelligent people in a competitive atmosphere. If you weren’t the best, you weren’t going to be there and if you don’t work hard at it, you wouldn’t be able to stay. I went to grad school 10 years later at UIC in order to become a teacher. I really was disappointed with the quality of student I was surrounded with. In fact, professors did not want to give students who deserved a “C” a “C” because it would have washed those students out of the program. As a teacher, if I were to start a new school again, I wouldn’t want more than a handful of my colleagues coming with me. The lack of accountability for U.S. students is also a problem. There is no exit exam in the U.S., so everbody graduates whether they’ve learned much. Show and shut up and you will get a high school diploma. How many students who graduate from a CPS school could pass a GRE exam? How many schools allow a student to fail a class or are the schools so scared they will have a low FOT (freshman on track), they refuse to allow a teacher to fail a freshman? Students are now graduating with ACT composites under a 15 and sub 1.5 gpas. What do you think that student knows? However, the school is level 2 because it had a high graduation rate and a FOT of 95%. If you just pass on students who are not learning because the system requires you to, you do not have rigor. The book’s shortcoming is that it overlooks the pervasive violence and institutional racism that U.S.students face. Submit your resume for a job, changing nothing but your name at the top. If your name is “Tom” you are more likely to get a callback than if your name is “Chiniqua.” Walk down the streets of South Korea at midnight, and you will be fine, regardless of your income. Walk down the streets of Little Village at midnight, and you may not make it home.